What If Your Garage Door Remote is Stolen? Imagine this scenario: you get back home from shopping to find your remote is not where you usually keep it. You look around but soon realize that you did not drop it and that it might have been stolen. This scenario, although unlikely, is very real. While the crime rate might have dropped, burglars still find new ways to rob you of your valuables. Stealing your remote to access your garage after days or weeks of planning and stalking is just one of them. And since Alpine homeowners don’t think their remotes could ever be used this way, they tend to get reckless about where they leave them. So if you hang your remote for anyone to see on the visor or on the dashboard, chances are you might be targeted by a thief. Even if they don’t know where you live, finding your address through your license plate has never been easier, thanks to the internet. They could even beat you to your home and rob you before you even realized what has happened. How to Disable Your Remote? First, you have to know how the remote operates. It emits a signal to a reliever in the garage door motor. The operating principle is the same regardless of the manufacturer, model or age. However, the code and the frequency under which they operate do vary. Most transmitters nowadays change the code every time the device is used. To disable your remote, find a button on the motor housing. Depending on the manufacturer the color of the button can vary. By pushing this button for a few seconds you change the programming of the opener, meaning that any remote becomes useless. Next follow the instructions provided by the manufacturer to reprogram any other keypads and remotes that have also been affected by the deprogramming. If you don’t have the instructions, find the manual on the internet or better yet, find a video tutorial. Be advised that simply unplugging and plugging the opener back in won’t work, as the openers have a backup power that helps them store the codes in case the power goes out. If you don’t want to reprogram the opener, you can disable all remotes by using the control panel if you have one. Just find the lock button and press it, and it will disable all remote devices and keypads. However, the open/close button will still work as intended. If you don’t have a control panel, but rather the wall control resembling a doorbell, your safest bet is to unplug the opener until you find out if your remote really was stolen. If you need to open and close the door, you will have to do it manually. It’s advised to contact an experienced Alpine garage door repair service for help on replacing the mechanism. Finally, if your garage door opener is operated wirelessly on your mobile device, erasing the current setting doesn’t mean you will have to reprogram your phone as well. 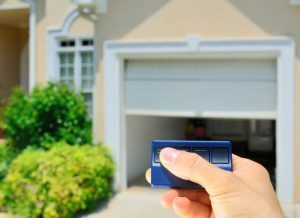 How to Prevent Garage Door Remote Theft? First of all, never leave your car doors unlocked if you keep the remote inside. Thieves operate at night when your vehicles are most vulnerable. Never keep the remote in a visible spot in your car like the visor. Try putting it somewhere safe or even taking it with you. Don’t keep any documents with your home address in the car, but take them with you in your wallet. Finally, opt in for smaller, more compact remotes you can carry on your person at all times. If you suspect having been robbed, contact the authorities immediately. Previous Previous post: Double Garage Door or Two Single Ones? Next Next post: Smart Garage Door Openers are Here to Stay!